The 29th Annual Martin Luther King, Jr. Breakfast will be held on Monday, Jan. 19, 2015, from 8:30 am —10:30 a.m. at the Oregon Convention Center, 777 NE Martin Luther King Junior Blvd., in Portland. Keynote speaker is the Rev. Benjamin Chavis, executive director of the National Newspaper Publishers Association and a former assistant to the Rev. Martin Luther King, Jr. At the age of 24, Chavis became one of the Wilmington 10, a group of teenagers and civil rights activists wrongly convicted of firebombing a grocery store in the city in 1971. In 1980 the convictions were overturned after members of the group had been imprisoned for nearly 10 years. More than three decades later, North Carolina Gov. Beverley Perdue in 2012 granted a “pardon of innocence” on the group, including state-paid financial settlements for surviving members. 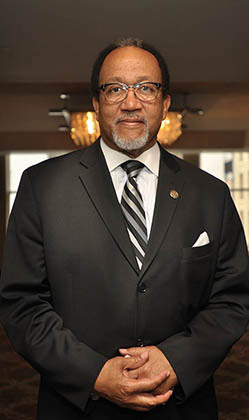 Chavis, a pastor in the United Church of Christ, has served as vice president of the National Council of Churches in 1988; was elected the youngest executive director of the national NAACP in 1993. Canned goods and boxed meals will be collected for the Martha Terrell Food Pantry, on Northeast 8th Avenue, and is available to any resident of that area. For the first time, we will also be collecting donations of newly purchased clothing, especially coats. The Skanner News Martin Luther King Jr. Breakfast is Monday, Jan. 19, 2015, from 8:30-10:30 at the Oregon Convention Center.